At the crest of a winding gravel road on a wooded hill in Montague, Massachusetts rests a little slice of heaven. Here, the woods open to reveal the post-modern home of Master Gardeners Bruce and Anne Aune. Their welcoming abode is nestled into a gentle, South-facing slope overlooking Mount Toby and the Connecticut River. The crushed stone circular driveway with its crisp, cut-in edges encompasses the center yard and creates a welcoming round garden, lovely even in the cold of December. Glancing down the hill, thirteen garden beds of meticulously planted and maintained trees, shrubs, and perennials surround the house. This gracious park-like setting melts into the woods as jardins sauvages (wild gardens). Bruce discovered this 3+ acre plot on which their house now rests back in 1990 on one of his frequent sojourns into the hills close to the University of Massachusetts at Amherst, where he was a Professor of Philosophy. “It was all wooded back then,” he shared. This locale, with its beautiful view of the Pioneer Valley hills and magnificent sunrises, captured his imagination. He soon took the plunge and purchased the property. Bruce and Anne’s 20+ years of gardening diligence and planning is evident everywhere throughout the landscape. Distinctive layers of plantings have been carefully added over time. Focal points such as Acer palmatum (Maple) and Stewartia pseudocamellia (Stewartia) trees are supported by perennials including stunning Paeonia hybrids and the climbing rose ‘William Baffin’ with underplantings such as Astilbe, Alchemilla mollis (Lady’s Mantle), and Hardy Geranium. In the beginning, Bruce had almost two acres cleared. As frequently happens, all the topsoil was removed in the clearing process. A small amount of fresh topsoil was brought in to start, later augmented by the Aune’s landscape designer who brought in 240 cubic yards of fresh loam for the rear garden beds and the lawn. Anne and Bruce later worked with a second landscape designer/mason who helped them plan additional gardens and hardscape features. They initially envisioned installing a handcart-wide circular garden path surrounding the house and inner gardens. Their designer encouraged them to think big and they then mutually decided to install a road approximately 600’ long and 5’ wide instead, allowing full-size vehicles to bring plants and supplies within easy access of the entire garden space. This road has also served as the key feature around which many of the garden beds were installed. To support the cutaway of the hillside created by the road installation, the Aunes have transformed the road’s edges over time with inspirational perennial beds and woody plantings. Starting on the house’s West side, one bed runs the length of the drive next to the woods. They used 100 cubic yards of rough cut wood chips to cover that outer border. It took a month’s division of labor, with Bruce bringing in the chips and Anne spreading them, to complete that project. They then planted multiple varieties of Hosta amongst these chips, perfect for the woodland edge. Their love for the broad color and textural variation within the Hosta species is evident both here and throughout the gardens where they have planted 150 Hosta varieties. A sample of these include ‘Gold Edger’, with its pink floriferous scapes, ‘Komodo Dragon’ with its deeply veined, heavily rippled umbrella-like leaves, ‘Fried Bananas’ with its unique glossy, golden leaves and ‘Blue Dolphin’, with its giant heart-shaped, heavily corrugated blue-green leaves. Bruce and Anne love to share their Hosta passion with other local gardeners by annually donating 80-100 divisions to the Amherst Garden Club’s spring plant sale. Continuing the display on the opposite side of the drive, the Aune’s have installed a graceful Hosta Walk within the garden bed lining the berm. 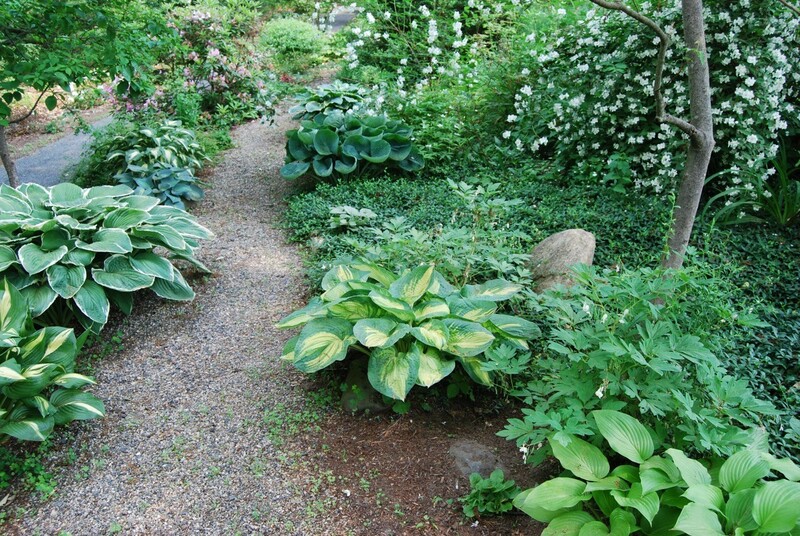 Starting near the house and anchored with a Ninebark (Physocarpus opulifolius), the walk’s pea gravel path flows along the bed, parallel to the inner road. Splashes of creamy yellow on bright green leaves and green strokes on blue hued leaves of the Hosta join companion plants including bleeding heart, mock orange, and 20-25 varieties of Epimedium, creating a lush garden walkway. Flowing Stephanandra shrubs line the inner driveway berm next to the walkway, holding back the soil from the road with their cascading stems while low growing Vinca minor fills in the gaps. It has taken 10-15 years to fill in fully. To complement the plant material in their gardens, the Aunes introduced hardscape elements. Architectural rock work enhances the Hosta Walk where a vertically placed canine tooth shaped stone provides dynamic contrast to the surrounding soft foliage. Large squarish rocks, often the size of small boulders, line sections of the berm and are artfully placed throughout the setting. The rock garden, located on the slight slope of the East side of the yard, was installed around 2000. The landscape designer brought in large rocks while Bruce and Anne added smaller stones from the woods and peagravel from garden centers. “There is always something blooming” in the garden, remarks Bruce. The rock garden serves as the backdrop for a stunning, rough- hewn stone bench with a tall, Stonehenge-like rock at the right edge, commanding the view below. Eye-catching benches are a theme in their gardens, each one unique and placed where one would naturally want to sit and absorb the surroundings. 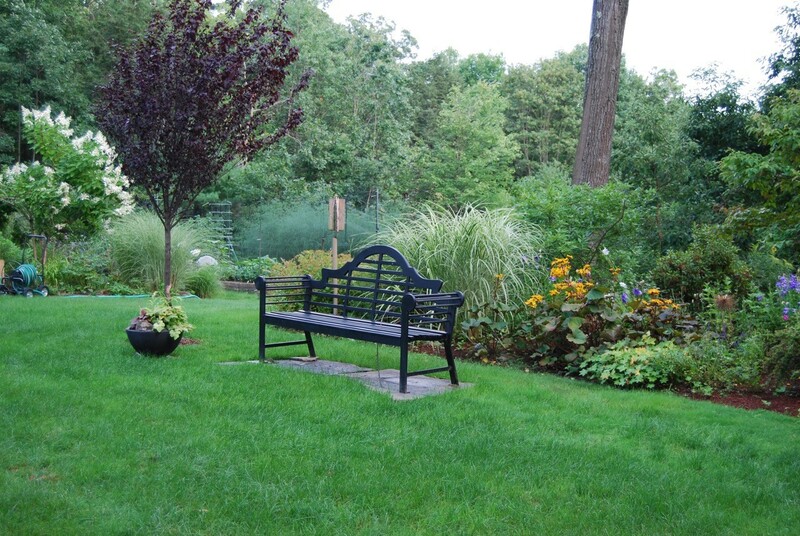 A black curvilinear Lutyens-style bench rests in front of a deep perennial bed. The garden bed features fountain-like Miscanthus layered with perennials including boldly golden Ligularia dentata with its large leathery leaves complementing violet purple Balloon Flower (Platycodon grandifloras) with its softer oval shaped leaves. These are underplanted with fleshy-leaved geraniums and other toe-level foliage. In pleasing contrast, nearby is a vividly bright red aluminum bench and chair set that brings chic slatted detailing and a punch of fun to the landscape. It sits upon wide, flat stones that Anne calls a ‘stone rug’ under a towering shade tree. “I call it a stone rug because it is too small to be called a patio!” she exclaimed. One of the first gardens they installed was a vegetable garden producing tarragon, peas, and asparagus, the latter of which they let go to seed in the fall for its lovely tall and frothy mature form. 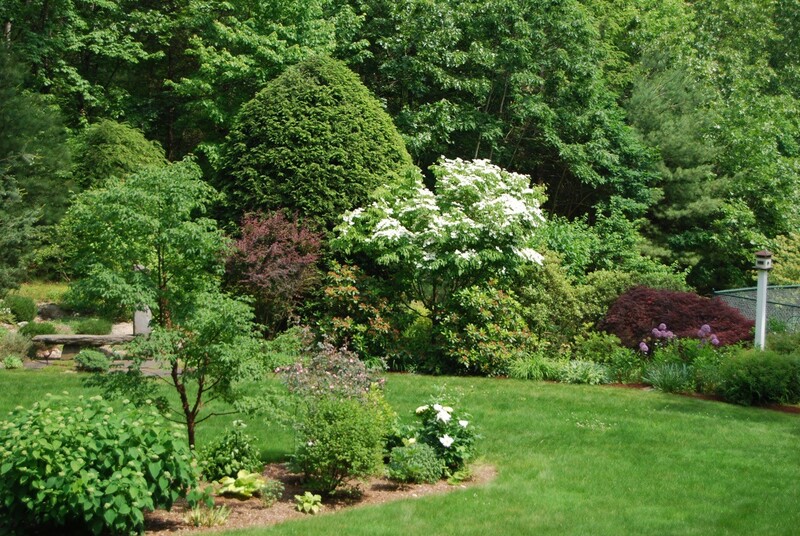 Later, in 2008, Bruce started a garden placed in the grassy open yard which Anne quickly dubbed “The Titanic” for its oval shape highlighted by a tall Acer griseum (Paperbark Maple) near the midpoint and a prolific Hydrangea ‘Incrediball’ anchoring the end, mimicking the ill-fated ship’s design. The ‘Incrediball’ is a favorite shrub, starting low and growing 5 feet in one season and always blooming profusely. It was almost inevitable that the Aunes and the Master Gardener organization would find each other. 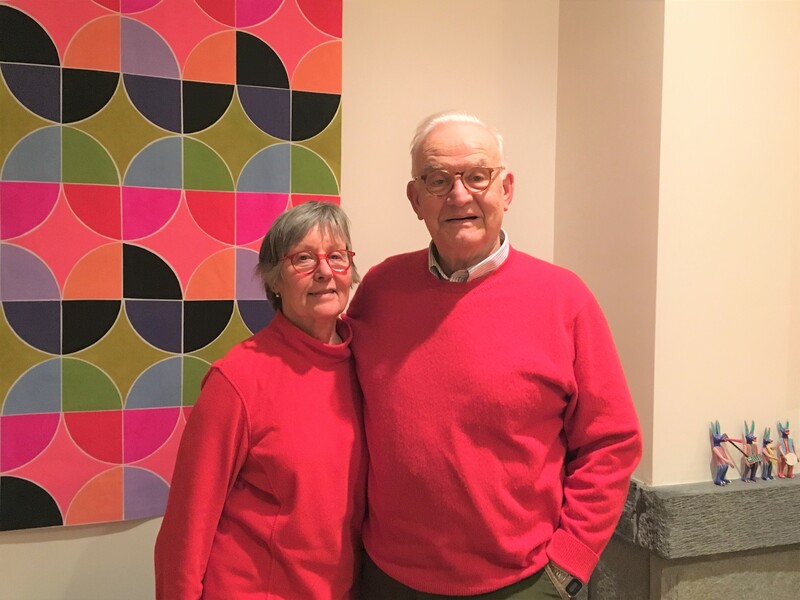 After Bruce retired from the University of Massachusetts Amherst in 2002, he and Anne turned more of their attention to gardens and garden education. They learned of the Master Gardener association from attending a class at Nasami Farm. It was 2007 when they saw an ad in the local paper for the Western Massachusetts Master Gardener Association (WMMGA) program and decided it looked interesting and fun. They applied and were admitted together, making them the first WMMGA husband and wife team. Bruce ran the WMMGA e-mail hotline for 10 years with Anne’s help. They have also enjoyed the wide variety of trips and symposiums WMMGA offers. Du Pont Garden, Wave Hill, the High Line garden, and Montreal Botanic Garden are just some of the fine garden trips they have taken.